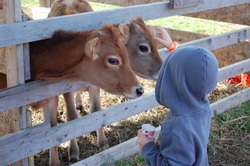 Guyette Farms is committed to providing unique family fun activities. While visiting our maze, we want our guests to have the opportunity to spend quality time together while enjoying all the fun. Our maze is designed and cut by hand. We try to design a maze that is both short enough for families with small children and yet challenging enough for avid maze enthusiasts. We offer several exits throughout the maze so that when you and your family have "had enough" you can escape. Each guest is provided a map to help with navigation. Throughout the maze, you will find checkpoints to help you locate where you are and to provide you with interesting facts. Our obstacle course is the largest one around. 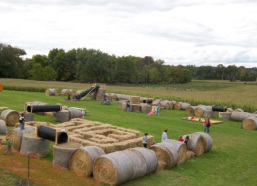 With over 150 bales, tunnels, ropes, and a playhouse build right in, guests of all ages can jump, climb, and crawl their way around. 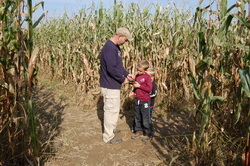 Designed especially for young children who might be overwhelmed with the large corn maze, This maze gives them the chance to explore on their own. The corn box is a unique experience. Children and adults alike, spend time sitting, digging, and dumping corn. Accompanied by a corn box of its own, our 20ft slide is the perfect size for both kids and adults. Our animals look forward to the fall. They love to be petted and fed! The 30 minute hayride gives guests the opportunity to relax as they journey around our farm seeing the sugar house, ponds, pasture of cows and beautiful fields. The ride also stops at the pumpkin patch. Visit our patch and pick your own pumpkin! Pumpkins from the patch are 25 cents/lb. Slide down the pipe into a corn box and climb on the bales. The indoor play area offers another place to play while visiting. How far can you launch a gourd? Challenge a family member or friend and see whose flies farther! A new favorite here at the farm! Things get a little tricky when using a gourd instead of a golf ball.